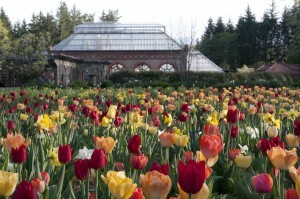 The conservatory serves as a beautiful backdrop for thousands of tulips each spring during Festival of Flowers. 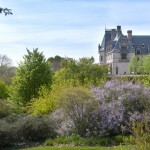 Spring is here – At last!, many may say – and it couldn’t be more vibrant than at the Biltmore in Asheville, NC. 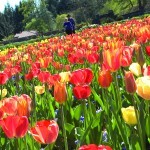 Over the estate’s 8,000 acres, more than 90,000 tulips are about to be in all their glory, as well as daffodils and forsythia, acres of azaleas that will be ablaze in pinks, purples, oranges, reds and white, and hundreds of roses. You can almost smell them!And you’ve got plenty of time to take in all of this blooming beauty through May. The Biltmore has added something new for guests this year – the opportunity to peek inside the private lives of the Vanderbilts, who once called the Biltmore home. 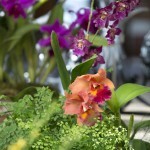 The Winter Garden, which is usually off limits to the public, will open its doors to display exotic orchids, which were enjoyed by George and Edith Vanderbilt and their guests. The Winter Garden will close its doors once again April 7. If you plan to visit the Biltmore this spring, you’ll enjoy a savings of $15 off your admission if you buy tickets at least seven days in advance of your visit, or $10 off if purchased one to six days in advance. During your time at the Biltmore, be sure to take advantage of the designer and expert horticulturist presentations, live music, wine tastings and outdoor activities. After the winter we’ve had, it’s time to get outside and enjoy the spring air. 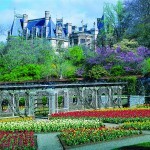 One of the most beautiful spots to do just that is the Biltmore! 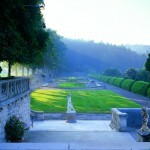 The Italian Garden is one of a series of outdoor “rooms” Landscape Architect Frederick Law Olmsted designed in the formal gardens surrounding Biltmore House. 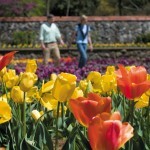 The Walled Garden below Biltmore House features pattern beds overflowing with more than 50,000 Dutch tulips each spring. Guests enjoy strolling through pattern beds in the Walled Garden where more than 50,000 tulips bloom. 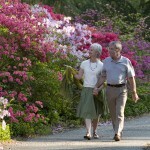 Azalea Garden – Sometime around May each year, Biltmore’s vast collection of azaleas burst into bloom. Shrub Garden, a rich, picturesque landscape with hundreds of woody plants. 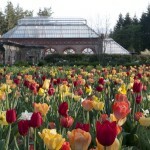 Walled Garden – Guests enjoy strolling through pattern beds in the Walled Garden where more than 50,000 tulips bloom. Photos courtesy of the Biltmore.